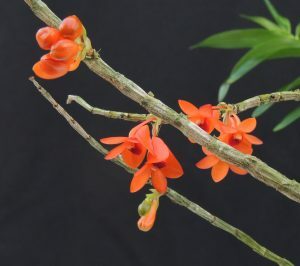 Continuing this week’s orange theme we have another bird pollinated species but this time it is a dendrobium from Asia. 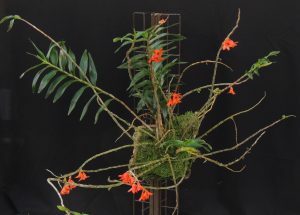 Dendrobium mohlianum is a dramatic species native to the Solomon Islands, Fiji, Samoa and Vanuatu (A real South Sea Islander). It is found in wet forests from 450 to 3000m altitude which indicates it is cool growing although we grow our plant very successfully in Warm Asia. It may be that our plant is propagated from plants found at the lower altitude range or that it is just not very fussy about temperature. It is likely to be sun bird pollinated and the unusual folded up lip is adapted for the beak of a hovering bird rather than being a landing platform for an insect. 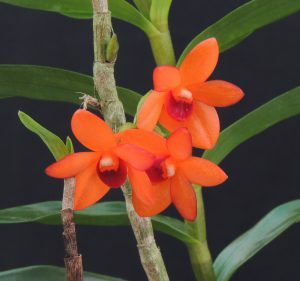 The orange colour is also a classic bird pollination indicator and all the orchids this week have been bird pollinated species. An unusual characteristic of the plant is to flower from old pseudobulbs – soma as old as seven years old on our plant. This produces a great display over time but remember not to cut off old leafless pseudobulbs or you will have no flowers. The flowers are very long lasting and with lots of buds still to open this plant will be at its peak from now until May. We grow the plant mounted but to reflect its natural habitat we water it freely and are happy to let moss grow naturally on the cork mount which helps to keep the plant wet between waterings.